Check back in the next few days for a full recap of Nitidus at the ARIAs. While you wait, why not head over to our merch page and get your ticket to see Diesel and Nitidus next Saturday, as well as other fine items for sale. Don’t forget to tune into the ARIA Red Carpet special tonight at 7pm on Network Ten followed at 8.30pm by the ARIA Awards. If you can’t be at Acer Arena tonight, don’t miss Ten’s broadcast! I’m here with the Nitidus boys and Dre at Acer Arena right now, and we’re just about to step onto the red carpet. That’s right, I’m writing to you all from the back of a limo. Gotta go meet the people, see you all next Saturday! It is now official: Nitidus will not only be attending this year’s ARIA award ceremony, but will also make an appearance on the red carpet. I guess they must have heard about our LA Music Award. This is a tremendous honour and we can’t wait to inject a bit of Nitidus hard rock style to the whole event. We will be rocking up to the red carpet at 4:26pm, making our grand entrance in an official ARIA stretch Chrysler 300cc. As our manager put it, “a real gangsta rock limo!”. Keep an eye out on Sunday 28th October, you may catch a glimpse of us on Channel Ten’s telecast. Stay tuned for more ARIA mayhem. 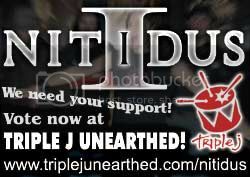 Nitidus are going to the ARIAs! The ARIAs are going to have Nitidus to deal with this year! We’re taking time out from our heavy song writing schedule to fly up to Sydney and attend the Australian Record Industry Association’s night of nights. Thanks to our esteemed colleagues in the music industry, we’ll be strutting down the red carpet with other Australian artists you may know, such as Missy Higgins, The Veronicas, Powderfinger, silverchair and more. During the award ceremony, we’ll be sharing a table with some of the most powerful people in the music business… then killing countless brain cells at the official and unofficial after parties. It’s a dirty job but someone’s gotta do it. Naturally we’ll be taking as many photos as we can get away with, so if there’s any particular celebrity you’d like to see sharing a Kodak moment with Nitidus, let us know by posting a comment below (we’ll try and snap as many as we can). Don’t forget to tune in to the ARIAs, which is televised on 28th October (check your local TV guide)… and then check back here for photos and other goodies. Don’t expect anything posted the next day though, as the band will be in hangover recovery mode.